The Davidson River area is one of the most popular for outdoor recreation within the Pisgah National Forest. Visitors enjoy hiking, mountain biking, horseback riding, rock climbing, fishing, nature study, photography, and other types of outdoor activities within this pristine and diverse watershed. It is the region's flagship National Forest recreation area. Located along a good highway and close to town, the area is perfect for someone who loves the outdoors but also likes being close to the amenities of the modern world. But some of the Pisgah Ranger District's greatest backcountry and wilderness areas lie within or adjacent to this drainage as well. 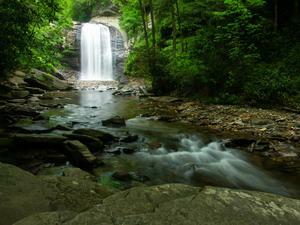 Looking Glass Falls and its namesake, Looking Glass Rock, are iconic sites in the Davidson River area, and are recognized features of the Pisgah National Forest, Western North Carolina, and the greater Blue Ridge Mountains region. Fall leaves cover a part of FS Rd. 477 on a wet, foggy day. The Davidson River's watershed area is bisected by US Hwy. 276 as it climbs northwest from the town of Brevard, up the valley and then the Pisgah Ridge, to the Blue Ridge Parkway, which roughly forms the northwest boundary of the area. Two mountain ridges reaching southeast from the Pisgah Ridge - Black Mountain and Pilot Mountain - form the northeast and southwest edges of the watershed, respectively, while the lower end spills out into the French Broad River valley and civilization along NC Hwy. 280 and US 64, which forms the far southeastern boundary. 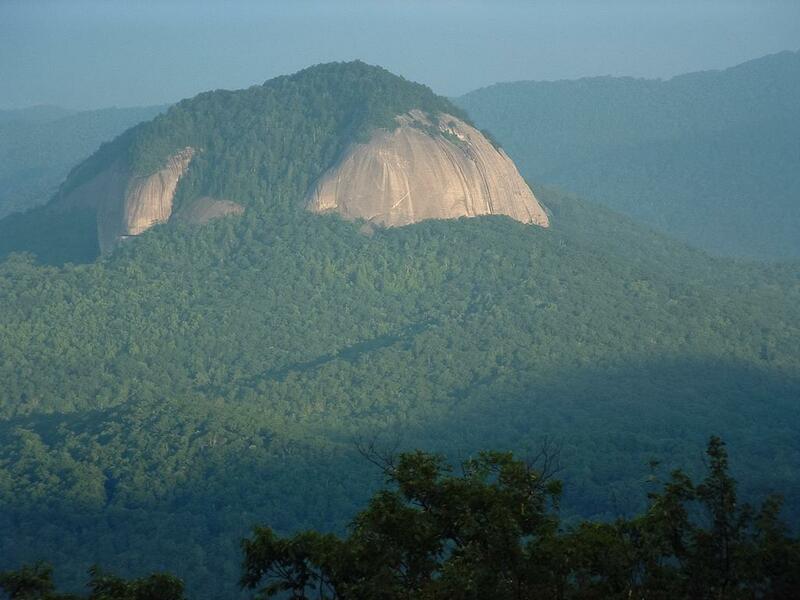 Looking Glass Rock - as much an icon of the area as Mt. Pisgah itself - sits right in the middle of the valley. As it leaves Brevard, US highway 276 follows the lower parts of the Davidson River before branching off along Looking Glass Creek. It then follows that tributary uphill to a reprieve at the relatively flat Pink Beds area, before next ascending the Pisgah Ridge to join the Blue Ridge Parkway. A good road, a spectacular natural setting and a great network of trails attract throngs of people to this area during the warmer months. The area is so popular, in fact, that groups have called for the creation of a new National Recreation Area to include the Davidson River watershed. However unlikely that is, the area certainly fits the bill as one of the finest outdoor playgrounds in the southern Appalachians - if not the entire country. Below is a description of what you'll find when driving north up US 276 from Brevard to the Blue Ridge Parkway. 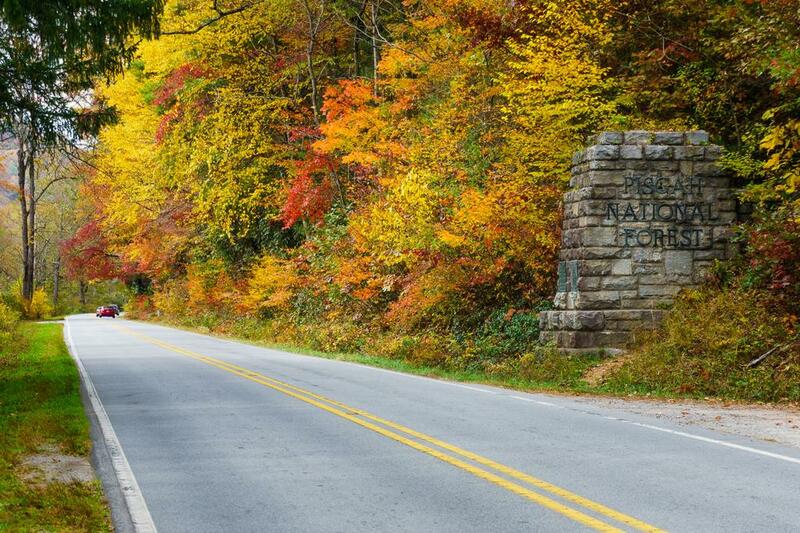 (This stretch of highway constitutes 15 miles of the 79-mile Forest Heritage Scenic Byway, which loops back around to Brevard via NC 215 and US 64.) Points of interest are shown in red; trails are shown in bold. Mileage is the distance from the Pisgah National Forest stone entrance sign, so reset your odometer there. All of this is also shown on the Davidson River Area Map. The Pisgan National Forest stone entrance marker surrounded by brilliant fall color on this warm October afternoon. Starting at the intersection of US 64/NC 280, you enter the Pisgah National Forest by a dramatic stone entrance marker (0 mi). The Sycamore Flats Recreation Area (0.3 mi) is the first site you encounter. A large, flat riverside picnic area is located there with all facilities. Next you will pass the large Davidson River Campground (1.1 mi) and the Art Loeb Trailhead on the left. The North Slope and Sycamore Cove (0.9 mi) trails (both moderate half-day loops) are both accessible from this parking area. You will then pass the Pisgah Ranger District Ranger Station and Visitor Center (1.4 mi) on the right, which offers plenty of parking, exhibits, restrooms, and a gift and book store. They carry excellent maps, and staff can provide information about the entire Pisgah National Forest. From the ranger station you can access the Andy Cove Nature Trail, the Exercise Trail, the Thrift Cove Trail, Black Mountain Trail, and Grass Road (all nice, easy to moderate trails). 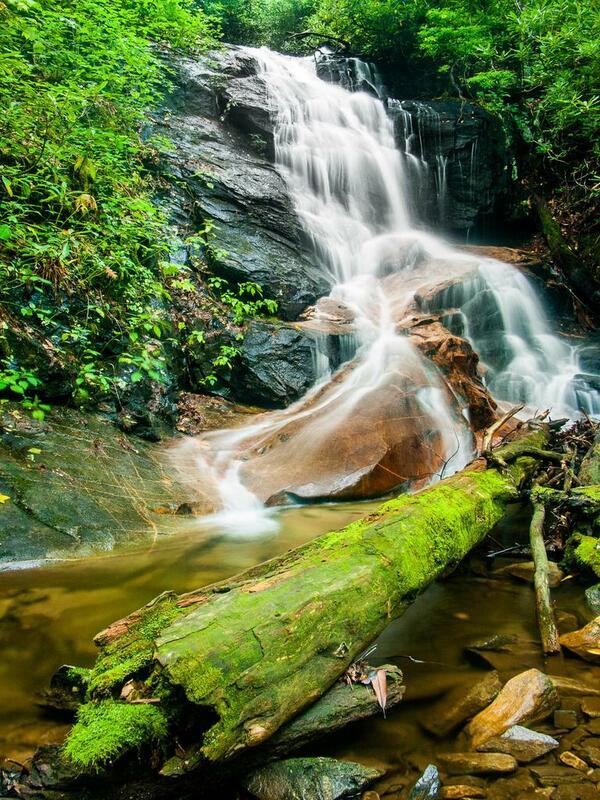 Log Hollow Falls, one of many located within the Davidson River's watershed. Past the Ranger Station, FS 477 turns right into the Avery Creek valley (2.1 mi). 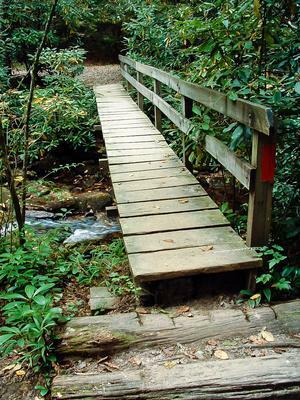 There are a few interconnecting trails including Bennet Gap, Buckwheat Knob, Buckhorn Gap, Avery Creek, Clawhammer Cove and Black Mountain. The Pisgah Horse Stables are also located along FS 477. Continuing along US 276, small pull-offs with enough room for just one or two cars invite you to stop and walk into the lush woods or down to the river, and some have roadside picnic tables. You'll pass the Coontree Picnic Area (4.7 mi) which sits next to an island and a great swimming hole in the Davidson River. It also provides access to the Coontree Loop Trail across the street. Just past Coontree, the Davidson River and Looking Glass Creek fork apart, and the road splits as well (5.2 mi). To the left is FS 475 which continues up the Davidson River; US 276 continues to the right along Looking Glass Creek. If you turn left here off of US 276 and onto FS 475, you will soon reach the very popular trailhead for Looking Glass Rock (5.6 mi). The Pisgah Center for Wildlife Education and Fish Hatchery comes next (6.6 mi), and is a great place to visit to learn about Pisgah's wildlife & see fish rearing in operation. Scenic. Starts in Pickelsimer Fields; a flat, grassy area with crystal clear streams meandering through. Typical streamside trail further along. Trailside waterfall. Stiff climb up to Butter Gap; passes headwaters of the stream. 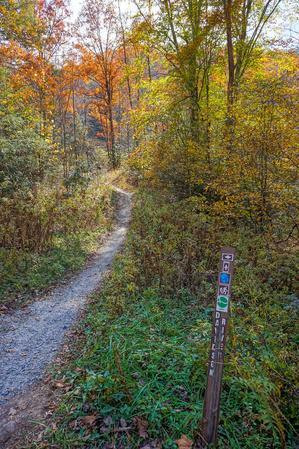 The Fish Hatchery parking lot provides access to the Cat Gap Loop, Butter Gap, John Rock and Long Branch trails. 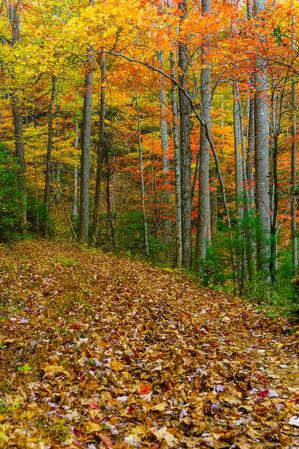 Continuing along FS 475, you will find the parking areas for the Cove Creek group camping area and Caney Bottom trail. Past that the road turns to gravel, passes the Daniel Ridge, Cemetery Loop, Long Branch and Art Loeb/Mountains to Sea trails, then exits the Davidson River area after climbing over Gloucester Gap. Just past the FS 475 intersection on US 276, you will very quickly come to the beautiful Looking Glass Falls (5.6 mi), one of the most scenic and most-photographed in the state. You will pass a few more small, pleasant roadside picnic areas as the road climbs above the falls. 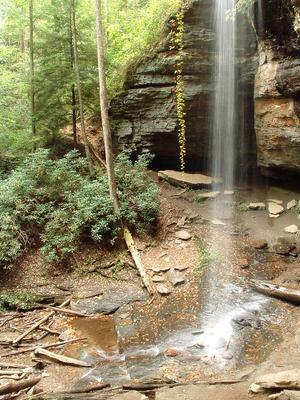 On the right, you will find parking for a trail: Moore Cove Falls (6.6 mi), which is one of the Best Hikes featured on this site. Next is the parking area for Sliding Rock (7.7 mi). This natural, 60-foot rock water slide ends in a deep, cold, clear pool and is an extremely popular spot for cooling off in the summer. The huge parking lot is often nearly full on warm summer weekends. However, sliding the rock is something everyone should do at least once! Past Sliding Rock, US 276 reaches a junction with FS 475B on the left (10.1 mi). This gravel road leads back around the north side of Looking Glass Rock to the Fish Hatchery area. US 276 will next bring you to the Forest Discover Center and Museum at the Cradle of Forestry in America (11.2 mi). This is a large interpretive indoor/outdoor museum showcasing the science and practice of forestry, from its historical beginnings right here in the Pisgah National Forest, up to modern day practices used across the nation. A fee is charged there. Next up along US 276 is the Pink Beds Picnic Area (11.4 mi). The Pink Beds is a high-elevation, relatively level valley sitting at the base of the Pisgah Ridge. (Technically, the Mills River drains this valley instead of the Davidson, but since it is off of 276 we include it here.) You can access the Pink Beds Loop, Mountains to Sea, Barnett Branch, and Club Gap trails from the picnic area. Northwest of the Pink Beds, US 276 begins a winding ascent of the Pisgah Ridge as it approaches the Blue Ridge Parkway. Two trails, the Buck Spring (12.8 mi) and Mountains To Sea (14.6 mi) trails join this section of US 276, one of them inside a hairpin turn. You'll reach the Parkway 15.1 mi past the entrance gate. If you go south along the Parkway, you'll reach more trailheads: Graveyard Fields, Black Balsam, and the Shining Rock and Middle Prong wilderness areas. 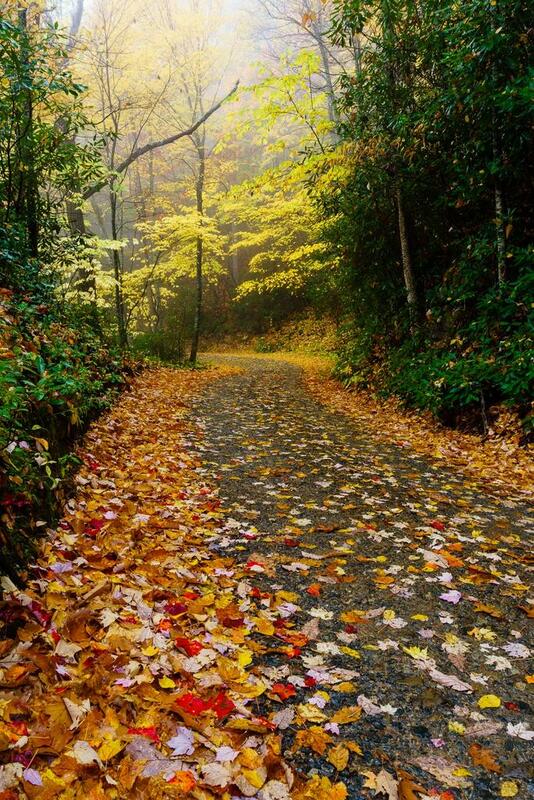 Four miles north on the parkway lies the Pisgah Inn & Mount Pisgah Recreation Area. It's about 16 miles beyond the Pisgah Inn to Asheville via the Parkway. If you stay on US 276 beyond the Parkway, the road descends the other side of the Pisgah Ridge, passes an access point for the Shining Rock Wilderness (the Big East Fork trailhead) after 2.8 miles, and continues on into the town of Waynesville 22 miles beyond the Parkway. This is just an overview of the trails and visitor facilities along US 276. 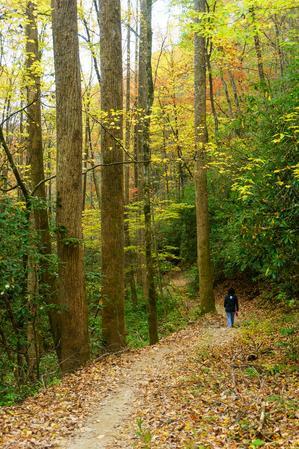 For details on all the individual trails, see the Davidson River trails page, and for what we consider to be the best hikes using this network of trails, see the Davidson River hikes page. Here's a map of the Davidson River area. For more maps, including printed publications, see our Davidson River maps page. Looking Glass Rock, as seen from the Blue Ridge Parkway looking back into the Davidson River valley. The formerly unincorporated town of Pisgah Forest (now a neighborhood of Brevard) lies at the big intersection of NC Hwy. 280, US Hwy. 64 and US Hwy. 276. From this intersection, the National Forest entrance gate is 100 yds. W. on US 276. Brevard's downtown is just 3 miles south on US 276. Dupont State Forest via Crab Creek Rd. is 3.7 mi. east on US 64. Hendersonville is 18 miles east on US 64. Asheville via I-26 is 16 mi. north on NC 280. Besides the food, lodging, and outfitters listed below, everything else you might need - gas stations, a shopping center containing a Wal-Mart and Bi-Lo grocery store, banks, ATM's, and a pharmacy - are all located in Brevard. After a long hike or a day in the river, everyone is bound to be hungry. For a sit-down meal, Pizza Hut is adjacent to Bi-Lo, and El Chapala Mexican Restaurant is one block East on US 64. My favorite, Hawg Wild BBQ, is right outside the National Forest gate on US 276, as is Dolly's Ice Cream shop. If you're in a hurry, there is also fast food in the shopping center (Subway, Taco Bell) and more 2 miles south along US 276/64 (Arby's, McDonalds & Wendy's, among others). Be sure to make time to visit the wide variety of local restaurants in downtown Brevard as well, though. They offer upscale and casual dining for every appetite! At the US 64/US 276/NC 280 intersection is Backcountry Outdoors outfitters & The Hub bike shop & bar (that's right), with all the gear you need for your trip into the Davidson River Area. Across the street, Davidson River Outfitters offers fishing gear, and Sycamore Cycles offers more in the way of mountain biking gear. Be sure to stop in before heading into the forest! The Hampton Inn is located at this corner. The Holiday Inn Express is 0.3 mi. S. on US 276/64. The town of Brevard is approx. 3 miles S. on US 276/64 and presents other lodging options. 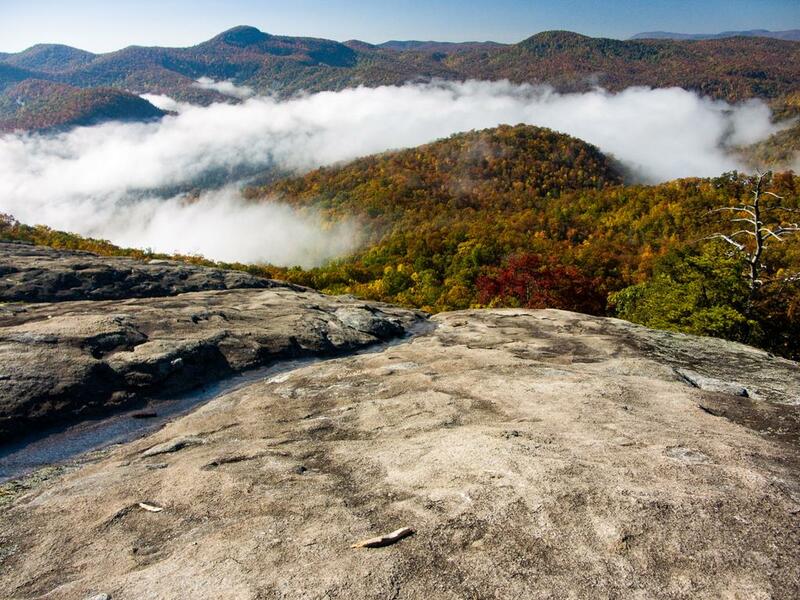 Fall from your cloud nine bed to the trail when you stay with us at the Hampton Inn Brevard. We are conveniently located at the gateway to the Pisgah National forest where you can actually hike straight from your room to the trail. The hotel is bike friendly and host to numerous cycling groups, races and training programs throughout the year. We also offer a large meeting room for events and can also assist with your group tours. The newly renovated Red House Inn provides comfortable bed and breakfast accommodation in downtown Brevard, NC. The Inn is a short walk from many shopping and dining opportunities and within easy driving distance to Brevard Music Center, Pisgah National Forest and Dupont State forest. 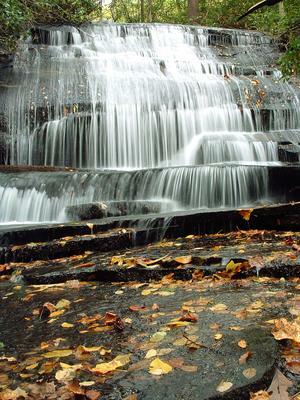 It is ideally situated for exploring the North Carolina mountains, visiting waterfalls, hiking, mountain biking and fishing. The Red House Inn is owned and operated by a couple who hike and bike frequently with their daughter and dog and will help you plan your outdoor experience in WNC! Camping is allowed anywhere on National Forest property, except within 500' of a road or in a designated closed area. Good campsites can be found along many trails in the area for possible backpacking loops. 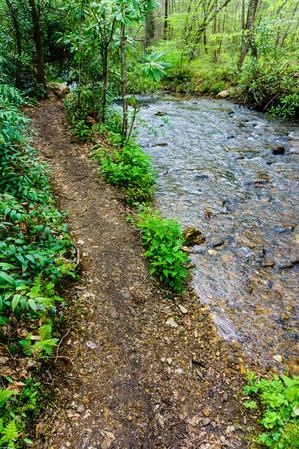 The Davidson River Campground is located about a mile past the main entrance to the National Forest when coming from Pisgah Forest, on the left. It is open year-round. There are 161 sites, some of which are closed during the winter months. Fees for sites range from $18/00/night for a single site (up to 8 people) away from the river and $20.00/night on the river to $36 & $40 for double sites. Flush toilets, hot showers, and amphitheater, and river swimming and tubing are all offered here. This campground is closest to the most trails: the North Slope trail starts right out of the campground itself, and several others start across the street! It's within a 10 minute drive of all trails in the Davidson River area. For more information and to make reservations, visit the Davidson River Campground's page on Reserve America. There are designated roadside campsites along forest service roads in the area as well. Roadside camping is only allowed in designated sites. Most offer level tent pads, with some having lantern posts and fire rings. Others are just nice flat areas. They are first-come, first-served and are usually completely full on summer weekends. From Asheville, take I-240 west to I-26 east. Take Asheville Airport exit (exit 9) and go south (right) on NC 280 for 16 miles. At the intersection with US 64/276, turn right onto US 276 and enter the National Forest. US 276 follows the Davidson River most of the way up to the Blue Ridge Parkway, with many attractions and trailheads along the way.